In this video, GIA Distinguished Research Fellow Dr. James Shigley provides an overview of recent developments concerning gem-quality synthetic diamonds. Gem-quality synthetic diamonds are more available in today’s jewelry marketplace than ever before, causing both interest and concern among jewelers about the material’s nature and whether it can be identified by gemologists or gemological labs. HPHT-grown synthetic diamonds are now available in the gem and jewelry marketplace in a wide range of colors, as evident from this attractive synthetic yellow diamond jewelry (1.00 to 1.25 cts) provided by Gemesis Corp. and these loose synthetic diamonds (each under 1 ct) from Lucent Diamonds and Chatham Created Gems. The colorless diamonds are natural. GIA has studied synthetic or 'man-made' diamonds extensively over the past 30 years, and we know a great deal about how they’re produced and can be recognized. While synthetic diamonds are lab-grown or factory produced, their chemical and physical properties correspond very closely to those of natural diamonds. Some people might refer to synthetic diamonds as imitations or simulants, but this is incorrect. Imitations like cubic zirconia or synthetic moissanite—which only look like diamond—have very different chemical and physical properties. This allows trained gemologists to recognize them readily. However, synthetic diamonds are much harder to detect. A wide variety of natural, synthetic, and color-treated gem diamonds are now available in the marketplace. Because they differ greatly in commercial value, proper identification is vital for both valuation and disclosure to consumers at point of sale. In some cases a trained gemologist can recognize these synthetic and treated diamonds by using standard gem-testing equipment. In other instances, positive identification must involve testing the diamond using advanced scientific instruments at GIA. At GIA we have created a large database of information on the gemological properties of diamonds of all kinds, which we use to help develop additional means of diamond identification. Beginning in the 1930s, scientists began to recognize that certain kinds of diamonds displayed similar features. They grouped the diamonds into two main categories called type I and type II based on differences in transparency under ultraviolet radiation. Scientists were able to further divide type I and type II diamonds into two subcategories by the arrangement of carbon—and impurity—atoms in the diamond structure. In 1959 they discovered that nitrogen was the principal chemical impurity in diamond and that while type I diamonds contained this impurity, type II diamonds did not. This diagram shows a simplified version of the diamond type classification system. 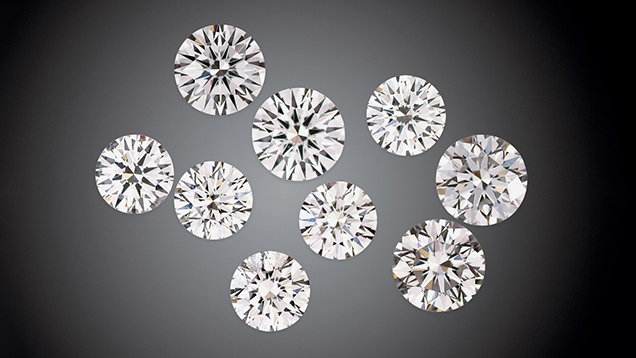 Type I (top row) and type II (bottom row) diamonds can each be divided into two subcategories based on the arrangement of carbon (and impurity) atoms in the diamond structure. C = carbon atom, N = nitrogen atom, and B = boron atom. Diamond type can be determined quickly with a scientific method called infrared spectroscopy. The vast majority of natural diamonds are what scientists call type Ia. Type Ia diamonds contain plentiful nitrogen in clusters or pairs. This kind of diamond cannot be grown artificially. Type Ib diamonds contain scattered and isolated nitrogen atoms that are not in pairs or clusters. Type Ib diamonds are rare in nature. 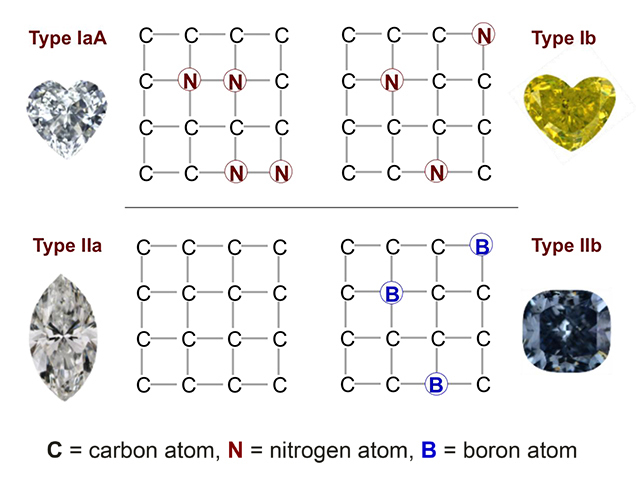 Type IIa diamond contain almost no nitrogen, while IIb diamond contains boron. Synthetic diamonds correspond to types Ib, IIa, and IIb, all rare categories among natural diamonds. At GIA type I and type II diamonds can be distinguished by the latter’s transparency under short-wave ultraviolet radiation, and both types can be definitively separated by infrared spectroscopy (The “Type” Classification System of Diamonds and Its Importance in Gemology, Gems & Gemology, Summer 2009, Vol. 45, No. 2). 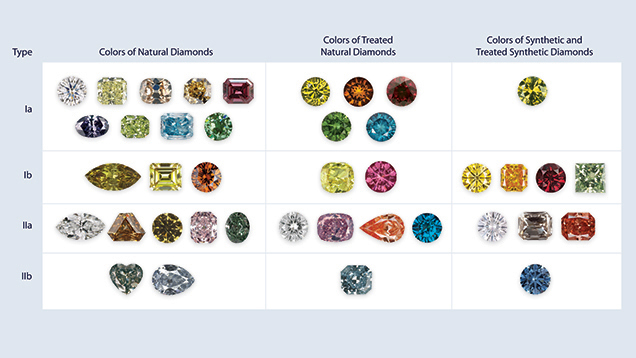 This table illustrates the relative abundance of the natural diamond types and the two kinds of synthetic diamonds. Most synthetic diamonds are either type Ib or type IIa. Table updated Nov. 2018. Natural diamond crystals formed millions—sometimes billions—of years ago deep in the earth, at depths of 100 miles (160 km) or more, and were brought up to the surface much later by explosive volcanic eruptions. These eruptions formed narrow vertical pipes of an igneous rock called kimberlite. Kimberlite pipes are mined to recover the diamonds, and the ore is mechanically broken down to free the crystals. The amount of diamond in kimberlite is very low—perhaps one part per million—so miners must process large amounts of ore to recover the diamonds. Natural diamond crystals (left) show typical rounded octahedral shapes that are the consequence of conditions deep within the earth. They’re brought to the surface by volcanic eruptions that form kimberlite pipes (center). The ideal crystal shape of a natural gem diamond is an octahedron (right). Diamond growth takes place on the eight crystal faces. Natural diamonds grow under a range of temperature and pressure conditions. The temperatures are higher than those used to grow synthetic diamonds. At high temperatures, diamonds grow as octahedral crystals, but in the lower temperatures of the laboratory, they grow as crystals with both octahedral and cubic faces. The great age of natural diamonds means that the nitrogen impurities in most diamonds have had time to aggregate into pairs or clusters, making the vast majority—over 95 percent—type Ia. Synthetic diamonds are grown over a very short time—several weeks to one month or more—under conditions different from natural diamond formation deep in the earth. Because of the very short growth period, the shape of a synthetic diamond crystal is very different from that of a natural diamond. Scientists first grew synthetic diamonds in the mid-1950s as tiny crystals. Production of larger crystals suitable for jewelry use began in the mid-1990s and continues today, with more companies becoming involved with diamond growth. Synthetic diamonds are grown in several countries for both jewelry and industrial applications—which may be the more important use for the material (Large Colorless HPHT Synthetic Gem Diamonds from China, Gem News International, Gems & Gemology, Spring 2016, Vol. 52, No. 1). The traditional synthesis method, called high-pressure, high-temperature (HPHT) growth, involves diamond formation from a molten metal alloy, such as iron (Fe), nickel (Ni), or cobalt (Co). The newer method, referred to as chemical vapor deposition (CVD) or low-pressure, high-temperature (LPHT) growth, involves diamond formation from a gas in a vacuum chamber. In both methods a diamond crystal or plate is used as a seed to initiate growth. HPHT diamond growth takes place in a small capsule within an apparatus capable of generating very high pressures. Within the capsule, diamond powder starting material dissolves in the molten metal flux, and then it crystallizes on the seed to form the synthetic diamond crystal. Crystallization occurs over a period of several weeks to a month or more to create one or a few crystals. HPHT synthetic diamond crystals typically show cubic faces in addition to octahedral ones. Because the shapes of natural and HPHT synthetic diamond crystals are different, their internal growth patterns also differ dramatically. These growth patterns can be among the most reliable ways to separate them. The resulting faceted synthetic gems often exhibit visual features such as color distribution, fluorescence zoning, and graining patterns related to their cross-shaped, growth-sector structure, as well as the presence of occasional dark flux-metal inclusions. In some cases the material exhibits persistent phosphorescence after the ultraviolet lamp is turned off. These synthetic diamonds can be positively identified using laboratory techniques such as visible and photoluminescence spectroscopy. Most HPHT-grown crystals are yellow, orangy yellow, or brownish yellow. Almost all are type Ib, which is rare in natural diamonds. Creating colorless HPHT synthetics has been challenging, as modifications to growth conditions and equipment are necessary to exclude nitrogen. In addition, growth rates for high-purity colorless diamond (type IIa or weak type IIb) are lower than for type Ib synthetic diamond, necessitating longer growth times and greater control over the temperature and pressure conditions. While it has traditionally been difficult to grow high-quality colorless HPHT crystals, recent developments have produced crystals sufficient for faceted stones over 10 carats in weight (Large Blue and Colorless HPHT Synthetic Diamonds, Lab Notes, Gems & Gemology, Summer 2016, Vol. 52, No. 2). The addition of boron in the growth system results in blue crystals. Other colors—such as pink and red—can be produced by post-growth treatment processes that involve radiation and heating, but they are less common. In HPHT synthesis, a press (left) applies extremely high pressures and temperatures to a central growth chamber that contains the necessary ingredient. This results in synthetic diamond crystals with combinations of cubic and octahedral faces (center and right). CVD diamond growth takes place inside a vacuum chamber filled with a carbon-containing gas, such as methane. A source of energy—like a microwave beam—breaks down the gas molecules, and the carbon atoms are attracted downward to flat diamond seed plates. Crystallization occurs over a period of several weeks to create a number of crystals at the same time. The exact number depends on the size of the chamber and the number of seed plates. The tabular crystals often have a rough edge of black graphite. They often also display a brown color that can be removed by heat treatment prior to faceting for gem purposes. Colorless gem-quality CVD-grown synthetic diamonds such as these (0.22 to 0.31 ct) are now commercially available, making proper identification important. Photo by Jian Xin (Jae) Liao/GIA. Most CVD crystals are brownish or grayish, but if a tiny amount of nitrogen or boron is introduced into the chamber, yellow, pink-orange, or blue crystals can be created. Colorless crystals are easier to produce with this method, but they require a longer time to grow. Most of the CVD-grown colorless material on the market is believed to have been brown crystals decolorized by HPHT annealing. CVD synthetic diamonds are most commonly type IIa. CVD synthetic diamonds have different gemological properties than HPHT-grown material. They tend to display even coloration and banded “strain” patterns when observed between crossed polarizing filters, and they are of high clarity with few, if any, tiny dark carbon inclusions. In CVD synthesis, deposition of synthetic diamond occurs from a carbon-rich gas onto a flat diamond seed surface. The synthetic diamond grows in thin layers, and its final thickness depends on the amount of time allowed for growth (left). This results in flat, tabular crystals (center and right) with exteriors coated in black graphite crystals. 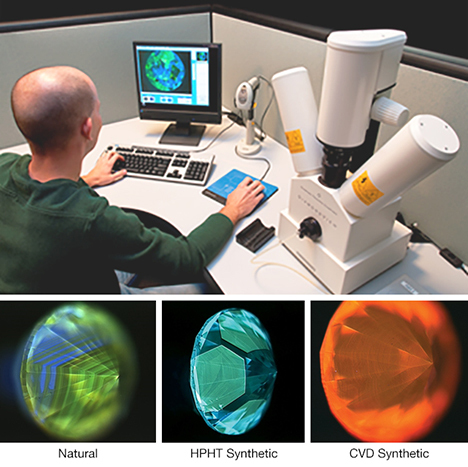 Like HPHT synthesis, CVD synthesis continues to improve and allow manufacturers to offer larger sizes and improved color and clarity (Recent Advances in CVD Synthetic Diamond Quality, Gems & Gemology, Summer 2012, Vol. 48, No. 2). GIA recently tested two large CVD synthetic diamonds weighing 2.51 and 3.23 cts, the largest CVD-grown diamonds GIA has examined to date (Two Large CVD-Grown Synthetic Diamonds Tested by GIA, Lab Notes, Gems & Gemology, Winter 2015, Vol. 51, No. 4). Idealized crystals (from left to right): CVD synthetic, HPHT synthetic, and natural diamond. Octahedral faces are shown as yellow and cubic faces blue. Most natural diamonds grow as octahedra (right), but HPHT synthetics (center) typically show a combination of cubic and octahedral faces. Octahedral faces are completely absent in CVD synthetics (left). Directions of crystal growth are shown by arrows. Dotted lines represent the position of the seed crystal in the HPHT synthetic diamond and the edges of the crystal in the CVD synthetic. Over the past few years, a growing number of companies have begun production of synthetic diamonds for jewelry use. There have been continued improvements in their clarity and color, as well as increases in carat weight. Considering the high incidence of synthetic diamonds in news reports, GIA encounters only a small number of synthetic diamonds—apparently submitted unknowingly for GIA grading reports. To identify gem materials of all kinds, a trained gemologist uses several kinds of gem-testing equipment, including a refractometer, an ultraviolet fluorescence lamp, a binocular microscope, a polariscope, and additional testing tools. As synthetic diamond quality improves further, it’s becoming more challenging to separate them from natural gems using standard equipment. While even a trained gemologist may not be able to recognize synthetic diamonds, they can be identified by GIA. This table lists many of the distinctive visual features of the two kinds of synthetic diamonds. These diagnostic features have been discussed and illustrated in the articles on synthetic diamonds in GIA’s quarterly professional journal, Gems & Gemology. Every issue—past and current—can be viewed and downloaded at the GIA website. These visual features are characteristic of the majority of synthetic diamonds, but not every faceted synthetic diamond will exhibit all of these features. For example, a particular synthetic diamond may not display any fluorescence. Therefore, it is important to base synthetic diamond identification on as many diagnostic features as possible. HPHT-grown colored synthetic diamonds often display uneven coloration that can be seen with transmitted light using the microscope, and if needed, immersing the cut stone in water or mineral oil to minimize surface reflections. This color zoning is due to how impurities, such as nitrogen, are incorporated into the synthetic diamond crystal as it forms. Occasionally natural diamonds display some color zoning, but not in the geometric pattern shown by HPHT synthetic diamonds. 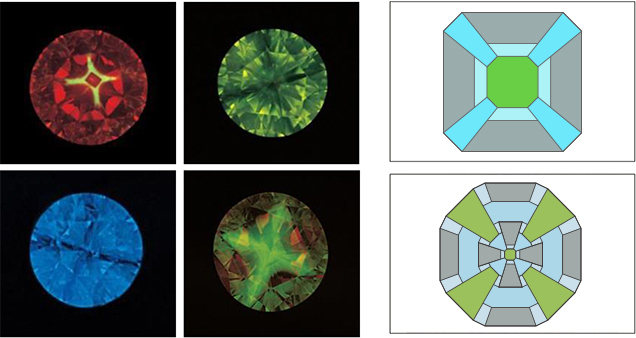 Color zoning in colored HPHT synthetic diamonds corresponds to the different crystal faces and results in different patterns than those seen in natural diamond crystals. Certain impurity elements are concentrated in particular directions of growth. The areas labeled Ib contain dispersed nitrogen impurities, those labeled IIb contain boron, and the colorless areas (IIa) are generally free of impurity elements. Only synthetic diamonds commonly show mixtures of nitrogen and boron impurities in the same crystal. In contrast, CVD-grown synthetic diamonds normally show even coloration. HPHT synthetic diamonds often display inclusions of solidified flux metal, which appear black and opaque in transmitted light but have a metallic luster in reflected light. Because the flux metal alloy used for diamond growth usually contains elements such as iron, nickel, and cobalt, synthetic diamonds with larger metallic inclusions can be picked up with a magnet. HPHT synthetic diamonds often display inclusions of flux metal, which appear black and opaque in transmitted light but have a metallic luster in reflected light. In some cases there are enough nickel-iron (Ni-Fe) flux inclusions present for a gem to be attracted to a magnet. CVD-grown synthetic diamonds form in a different way, and they do not have metallic inclusions. Some natural diamonds contain dark inclusions of graphite or some other mineral, but these inclusions do not have a metallic luster. When examined between two polarizing filters oriented at a 90-degree angle to one another, a natural diamond often exhibits a bright crosshatched or mosaic pattern of interference or “strain” colors. These interference colors arise from the diamond being subjected to stresses while it was deep in the earth or during its explosive eruption to the earth’s surface. In contrast, synthetic diamonds grow in a nearly uniform pressure environment where they are not subjected to stresses, so when examined in the same way, they display either no strain pattern or a weak banded strain pattern. The fluorescence of synthetic diamonds is also often quite helpful for identification—it is often stronger under a short-wave than a long-wave ultraviolet lamp, and it can display a distinctive pattern. HPHT synthetics typically display a cross-shaped fluorescence pattern on the crown or pavilion. HPHT-grown synthetic diamonds tend to show a cross-shaped fluorescence pattern on the crown or pavilion of the cut stone. CVD-grown synthetic diamonds may show a striated pattern when viewed through the pavilion facets. Typical fluorescence colors are green, yellow-green, yellow, orange, or red. When the ultraviolet lamp is turned off, the synthetic diamond may exhibit persistent phosphorescence for up to a minute or more. At GIA we use a fluorescence imaging instrument called a DiamondView for examining diamonds. This instrument reveals the characteristic growth patterns within diamond crystals. as natural, while the cross-shaped pattern (center) is diagnostic of an HPHT synthetic. The real identification challenge facing the jewelry trade is the testing of very tiny diamonds, or melee. This material is sold in parcels of several hundred to several thousand small gemstones, which can include both natural and synthetic diamonds (Screening of Small Yellow Diamond Melee for Treatment and Synthetics, Lab Notes, Gems & Gemology, Winter 2015, Vol. 51, No. 4). This group of 359 intensely colored round yellow diamonds (0.02 to 0.03 ct) was screened by GIA. 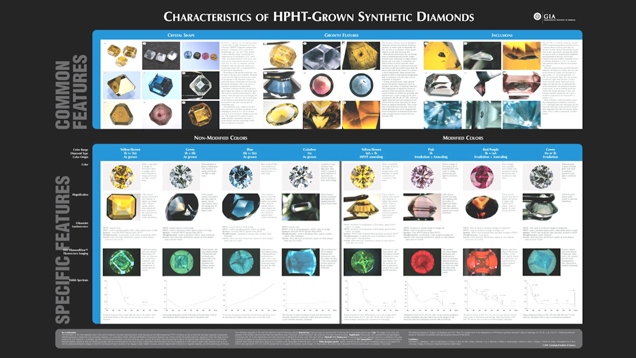 The majority were natural (left), 14 were HPHT synthetics (center), and one was HPHT-treated natural diamond (right). They all displayed uniform appearance and could not be distinguished visually. Photo by Sood Oil (Judy) Chia. To help the jewelry trade deal with this problem, GIA has recently developed an automated instrument for testing very small diamonds, and we will be introducing a new testing service in our laboratory. 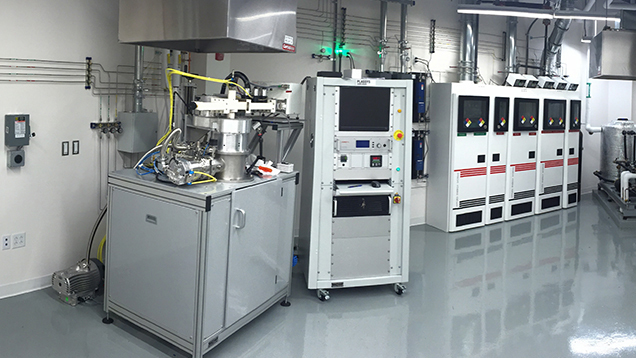 As part of our ongoing research program on synthetic diamonds, GIA has also recently set up a CVD growth facility where we will be able to produce our own synthetic diamonds for study. GIA’s CVD diamond growth facility. The growing synthetic diamond crystal can be seen in the vacuum chamber (left). When the growth was completed, the crystal was removed from the chamber (right). It had a black surface covering a colorless interior. To summarize, synthetic diamonds are now being made available in increasing quantities for jewelry use. Based on more than 60 years of research, we know that synthetic diamonds can be identified, if not by a gemologist, by the GIA Laboratory. If you have further questions on synthetic diamonds, please contact GIA. Editor’s note: This article is a summary of a presentation given at the 2016 JCK show in Las Vegas. Dr. Shigley is a distinguished research fellow at GIA in Carlsbad. Identification of synthetic diamonds, ensuring disclosure through laser inscription and distinctive reports. Examines a new source of colorless and near-colorless gem-quality HPHT synthetic diamonds using spectroscopic and gemological analysis. This article compares some of Chatham Created Gems’ synthetic colored diamonds to natural diamonds and explains the results. A new chart, supplementing the one published in the Winter 1995 issue of Gems & Gemology, summarizes the features of both as-grown (“non-modified”) and treated (“modified”) synthetic diamonds currently in the gem market (that is, those grown by the high pressure/high temperature technique). CVD Synthetic Diamonds from Gemesis Corp.
An examination of the gemological and spectroscopic properties of CVD synthetic diamonds from Gemesis Corp. 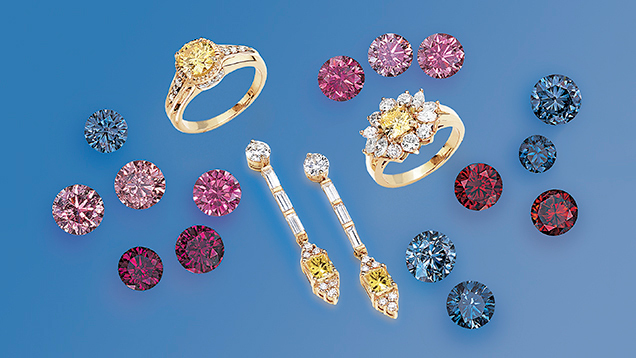 Pink CVD lab-grown products can be separated from natural and treated-color natural pink diamonds by a combination of gemological and spectroscopic properties, which are explored in this study. Latest-Generation CVD-Grown Synthetic Diamonds from Apollo Diamond Inc. High-quality CVD-grown diamonds, comparable in color and clarity to natural diamonds, can be identified using a combination of gemological and spectroscopic properties. Analysis of a 5.03 ct HPHT-grown blue synthetic diamond, the largest ever examined by GIA. A parcel revealed to contain natural, treated, and synthetic diamonds reinforces the importance of identification. Examination of the largest HPHT synthetic diamonds GIA has examined to date demonstrated significant progress in this growth technology. The Bangkok lab examines near-colorless HPHT synthetic diamonds in melee sizes. Examination of the largest HPHT synthetic diamonds GIA has examined so far demonstrated significant progress in this growth technology. Although this stone bore some superficial resemblance to moissanite, its gemological properties were consistent with HPHT synthetic diamond. The New York lab discovers a synthetic melee diamond in a pendant, underscoring the importance of testing for undisclosed synthetics. Melee diamonds can be efficiently screened for synthesis and treatment using infrared absorption spectroscopy, DiamondView imaging, and microscopy. A round-cut specimen set in a ring is the first mounted CVD synthetic melee diamond identified by GIA. Advancing CVD growth technologies yield intensely colored, high-quality synthetic diamonds, such as the two green-blue synthetic materials seen in the New York lab. The New York lab examines three pink CVD synthetic diamonds which have received LPHT annealing treatment. Examination of a CVD synthetic diamond with an unusual pattern of growth dislocations that resemble natural inclusions. A look at the first CVD synthetic diamond examined at GIA that has been irradiated to a blue color. Examination of two CVD synthetic diamonds with an unusual Fancy Dark gray color. A Fancy yellow type Ib CVD-grown synthetic diamond undergoes testing at the New York lab. A natural diamond with a CVD synthetic film is examined at GIA's Carlsbad lab. Deep blue fluorescence in a CVD synthetic diamond mimic patterns found in natural specimens. Report on the analysis of an unusually large CVD synthetic diamond, unique in that its Faint to Light pinkish brown color doesn’t appear to be the result of post-growth treatment. The gemological and spectroscopic characteristics of these type IIa synthetic diamonds suggested that they experienced different growth and/or treatment histories. The New York laboratory recently tested a 2.16 ct CVD synthetic from Scio Diamond Technology Corp., the largest specimen GIA has seen so far. Recently, an unusual 0.94 ct Fancy yellow-brown emerald cut was submitted to GIA for a synthetic diamond grading report. It contained a cloud of black needle-like inclusions occurring along a plane and showed weak green transmission with fiber-optic illumination. Experts from GIA and De Beers joined together at the March 2015 Baselworld exhibition to assure a concerned diamond and jewelry industry that the means exist to detect and identify all synthetic diamonds. Synthetic Diamonds: How Many Are Out There? Another report of a gemology lab spotting a parcel of undisclosed synthetics has prompted renewed questions about how many synthetics may have infiltrated the gem market – and there is considerable disagreement. A report on the HPHT growth of large, gem-quality colorless synthetic diamonds in China. In mid-2012, one of the international diamond grading laboratories in Antwerp reported undisclosed CVD synthetic diamonds, causing a stir in the diamond industry. The CVD process is quite different from natural diamond formation. It produces diamond from a heated mixture of a hydrocarbon gas (typically methane) and hydrogen in a vacuum chamber at very low pressures. The physical properties of CVD synthetic diamond fall well within the range for natural diamonds in terms of hardness, thermal conductivity, strength, and so forth. Therefore, CVD synthetics are as hard and durable as natural diamond and display the same brilliance and fire when cut as a gemstone. CVD synthetic diamonds are readily detected in a gem laboratory, in specimens of any size or color.